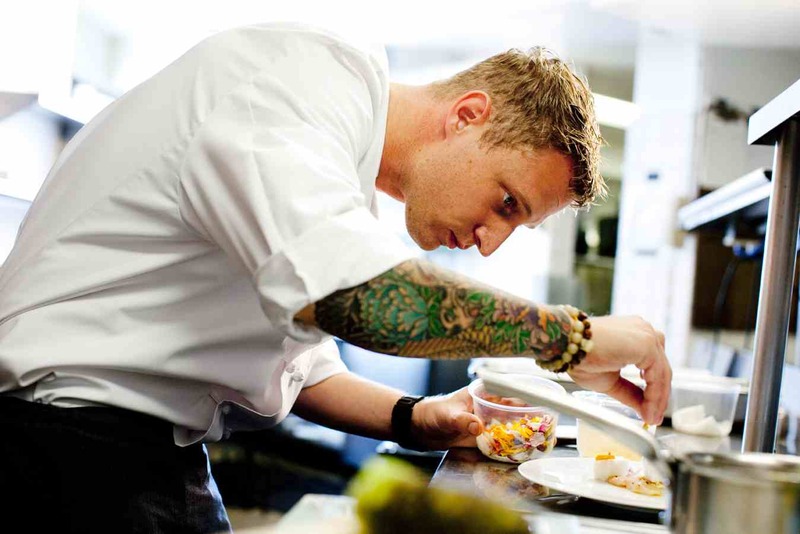 Michael Voltaggio began cooking when he was a teenager in Maryland. He has been the recipient of several awards including the AAA 5 Diamond and Mobil Award while serving as Chef de Cuisine at the Dining Room at the Ritz Carlton in Naples, Florida as well as a Michelin Star while serving as Chef de Cuisine of Charlie Palmer’s Dry Creek Kitchen in California. 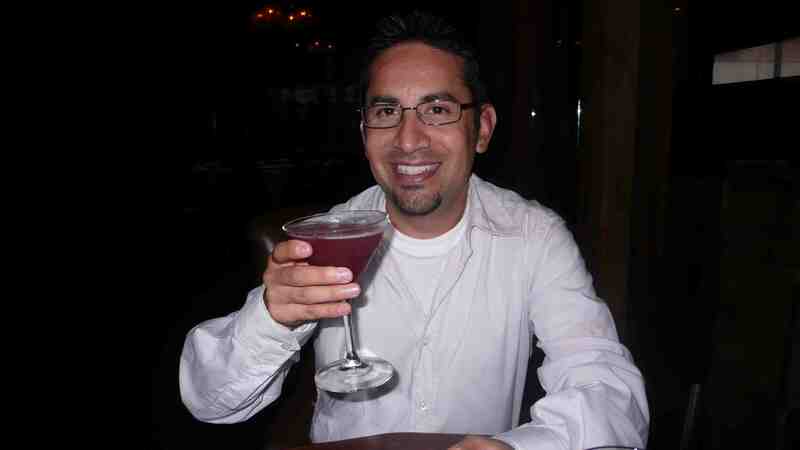 In 2009, he was a finalist for the James Beard “Best New Restaurant” award. He served as Chef de Cuisine at Bazaar by Jose Andres before moving to the Langham Huntington Hotel and Spa earlier this year. 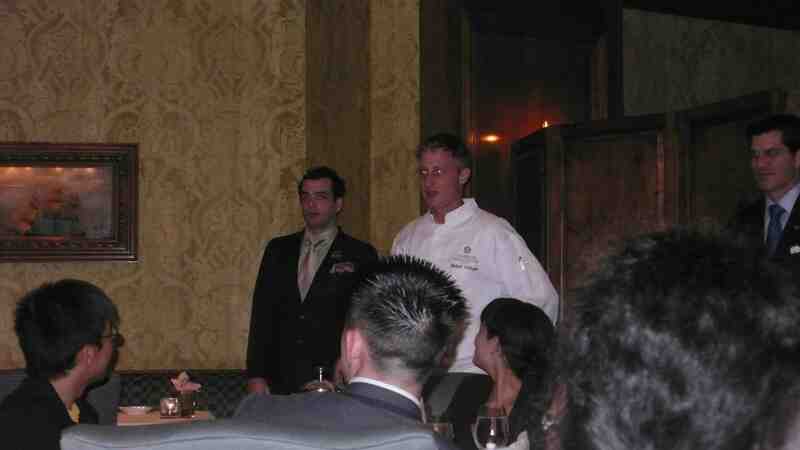 He is competing against his brother Bryan, also a chef, on this season of Top Chef on Bravo TV. Last night my friend Dalbert and I travelled over the hill to the new Hakobe restaurant on restaurant row (La Cienega) just east of Wilshire. 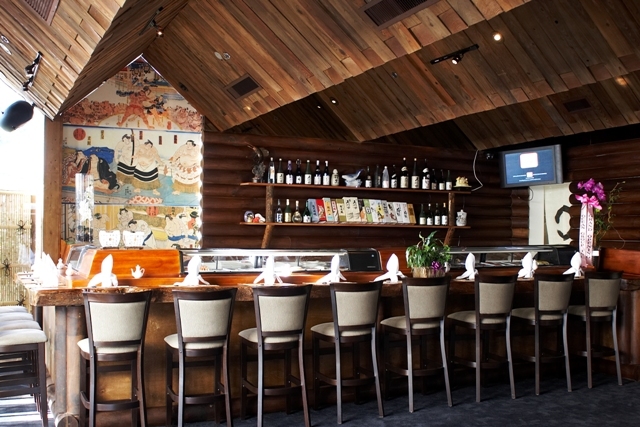 Residing in the old Lodge Steakhouse, the new Japanese eatery looks the same (tables made from trees remain) with an addition of a sushi bar. 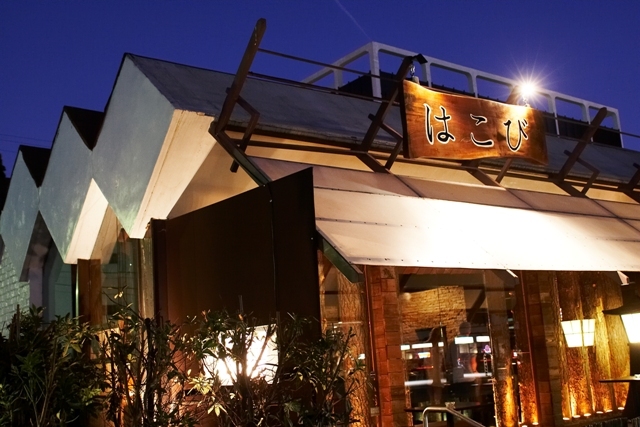 The seating is divided into two sections, a busier indoor with the sushi bar and a nice adjacent area with intimate booths. 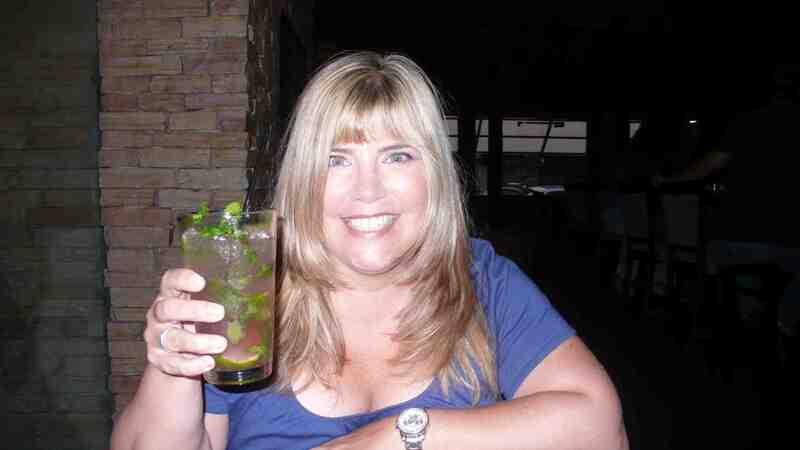 Dalbert had the dirty geisha (really good with a strong punch) and I had the raspberry mojito. Both very good. 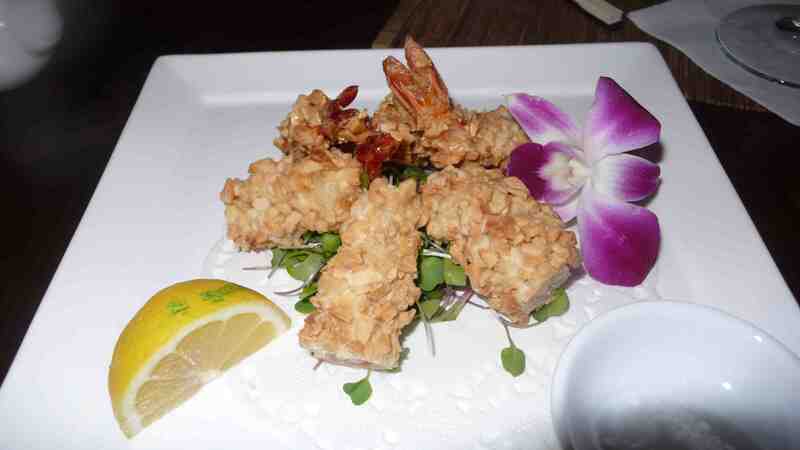 Our waitress recommended the almond crusted shrimp tempura with lemon and salt. We were glad we got to sample it – shrimp covered with a thick crunchy almond coating. 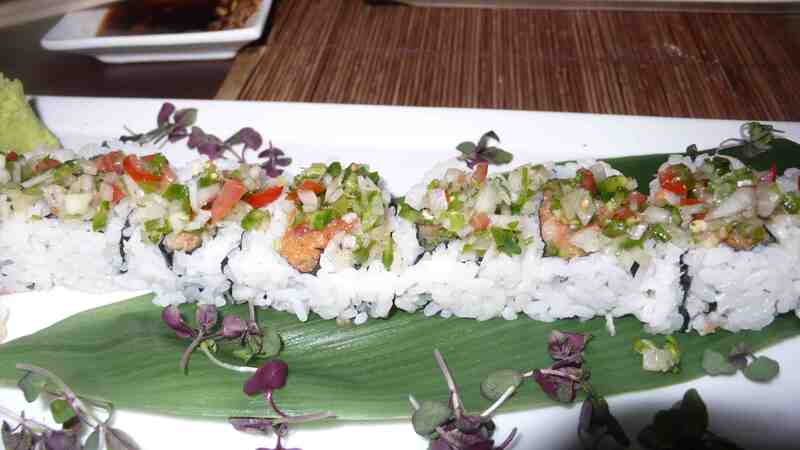 We both were craving sushi when we arrived, so the chef provided a sample platter of sushi and then a very spicy salmon cut roll with fresh salsa on top. All of it was delicious. 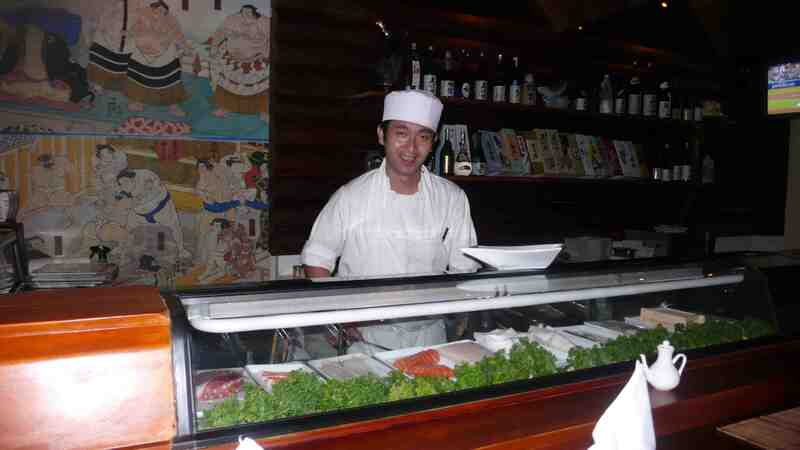 We stopped by the sushi bar to say hello to the chef. 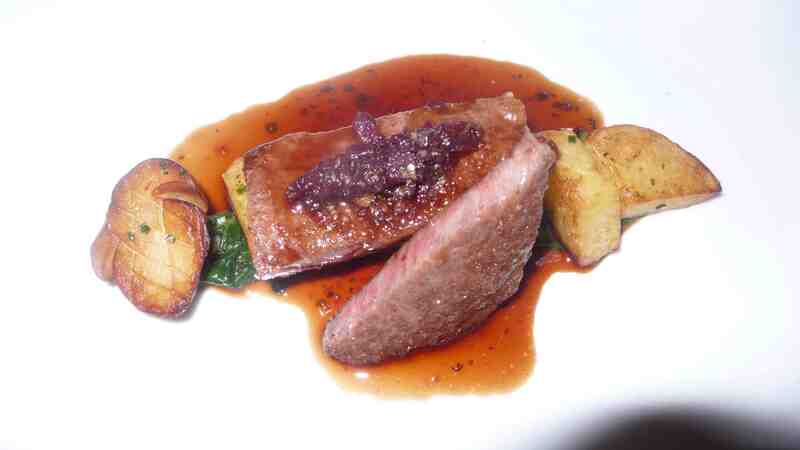 Next came our entrees, I had the wagyu beef with came with a peppercorn and truffle sauce. 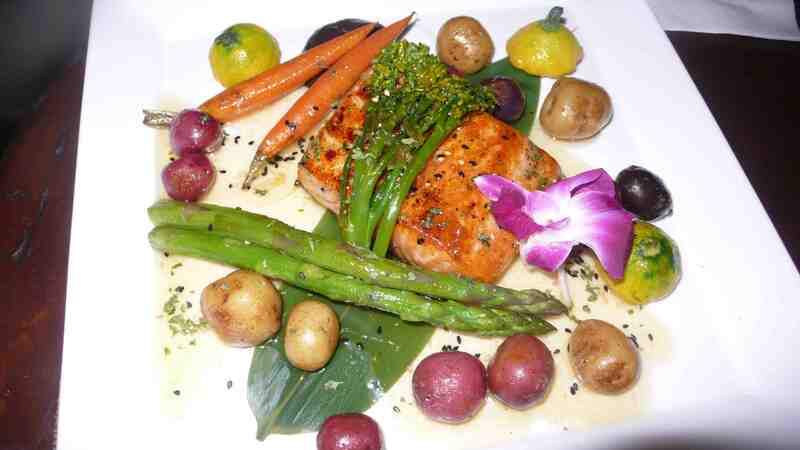 Dalbert opted for the salmon with sweet wine sauce. Both were cooked perfectly and included a pretty arrangement of colorful fresh vegetables. For dessert, we both love mochi so we ordered a mochi sampler which came with Kona coffee mochi (our fave of the three), strawberry and green tea. 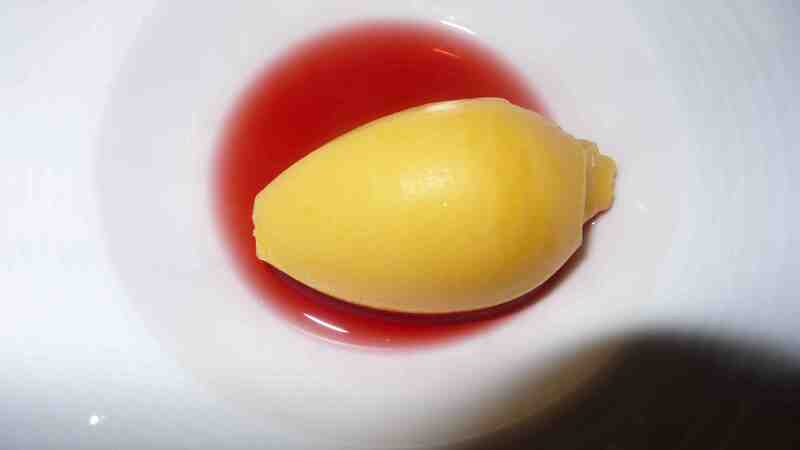 It came with a tasty blood orange. 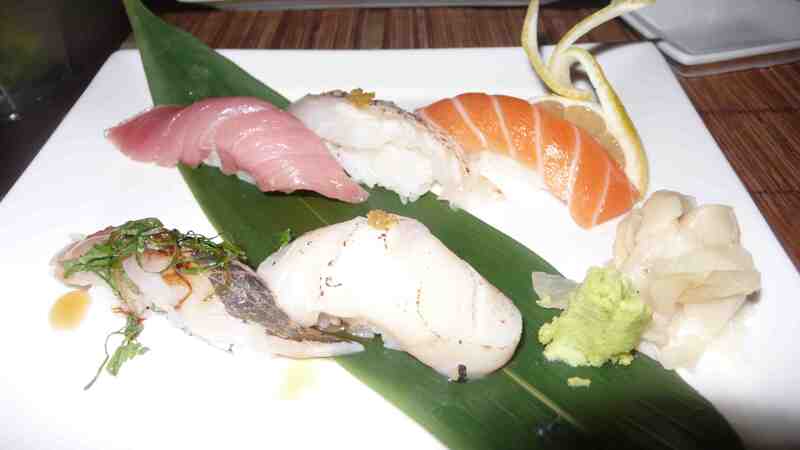 The entire dinner was beautifully plated and delicious, definitely worth a trip over the hill either for sushi and sake at the bar or for entrees. 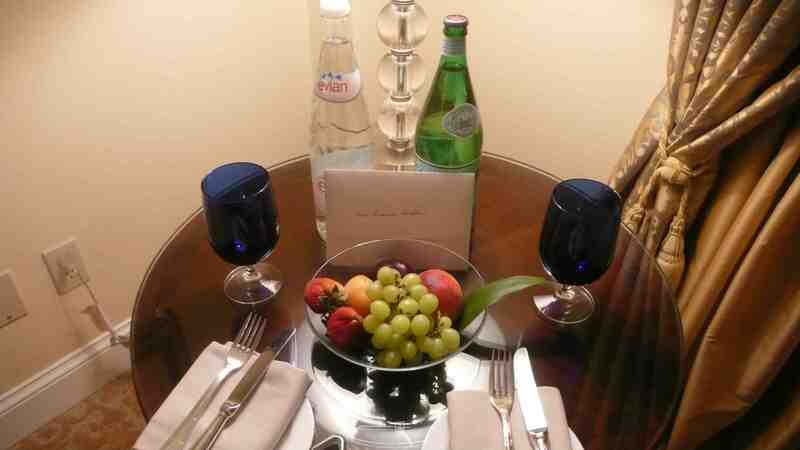 A few weeks ago I checked into the Ritz Carlton in San Francisco. I was lucky to be upgraded to a suite which had a huge living room and bedroom and a bathroom three times as big as the one in my house. It was beautiful. The neoclassical style San Francisco landmark resort on Nob Hill houses 336 rooms and suites featuring antique-style furnishings, Oriental rugs, elegant window treatments, contemporary artwork and Italian marble bathrooms. The in-house fitness center includes a workout room, heated indoor pool and spa. This is really cool as it is in the basement of the resort and the pool is huge, well worth a visit. 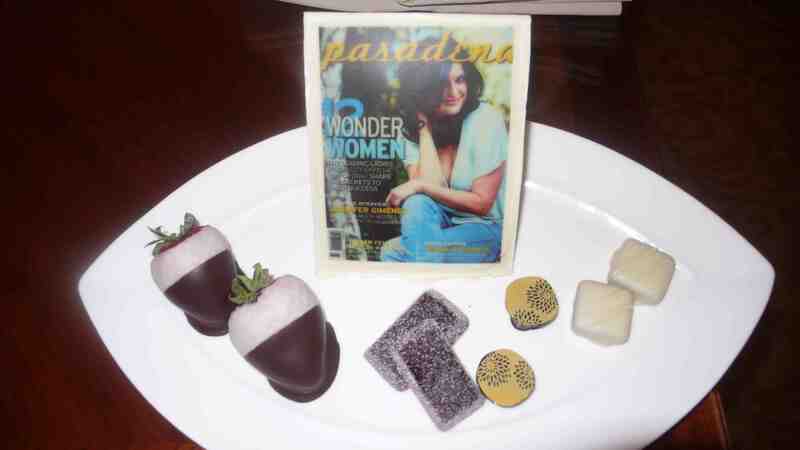 The pastry chef made a replica of the current Pasadena magazine cover out of chocolate (see above), as I was doing a story for Pasadena magazine. It was too pretty to eat so I just took a pic of it. I also got the below yummy welcome tray. We started the evening off with champagne. We tried a sip of each of the bottles on the champagne cart and all were delicious. 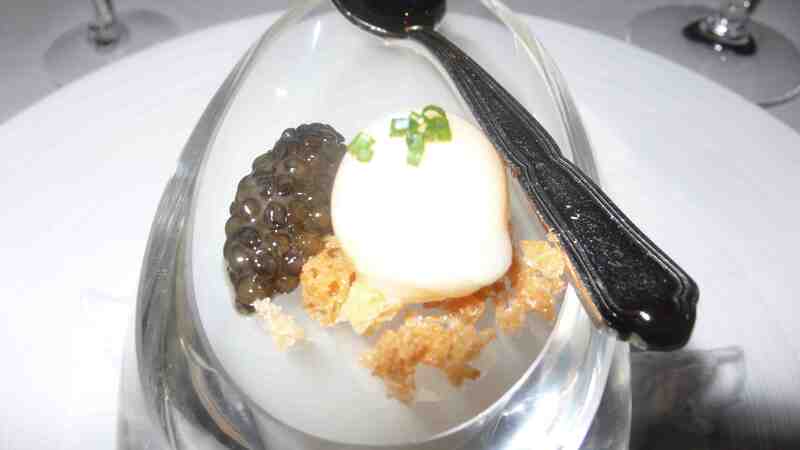 The chef sent us a quail egg with golden osetra caviar to start. I got the white corn and pepper soup with basil and dungeness crab at the bottom and Matt received the Cream of Porcini soup with curry and suckling pig. 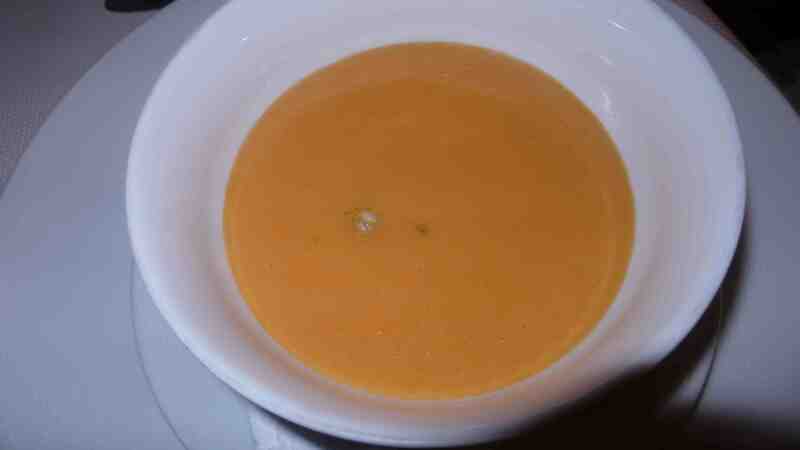 We shared since both soups were really tasty. We then got three dishes all together and shared them all. 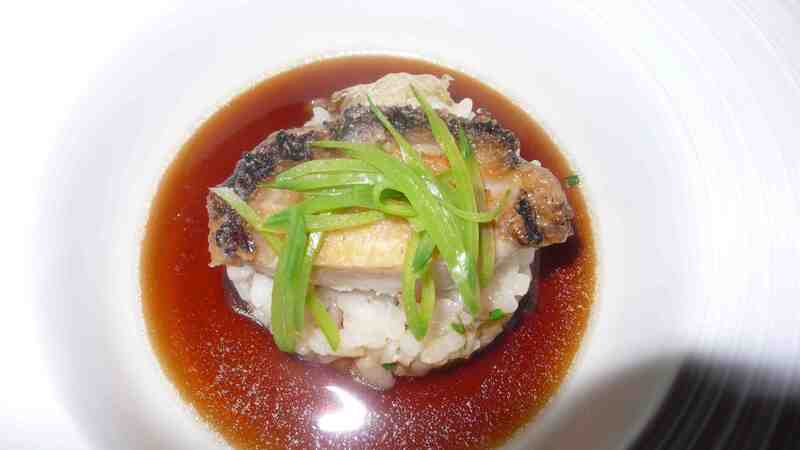 The abalone came with sugar snap peas that were very fresh and japanese rice scented with marin in a dashi broth. 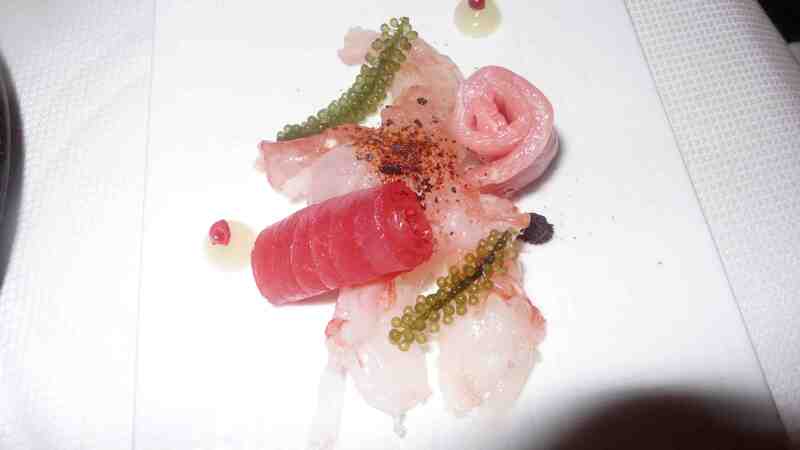 The tuna sashimi and spot prawn with yuzu gelee were also delicious. 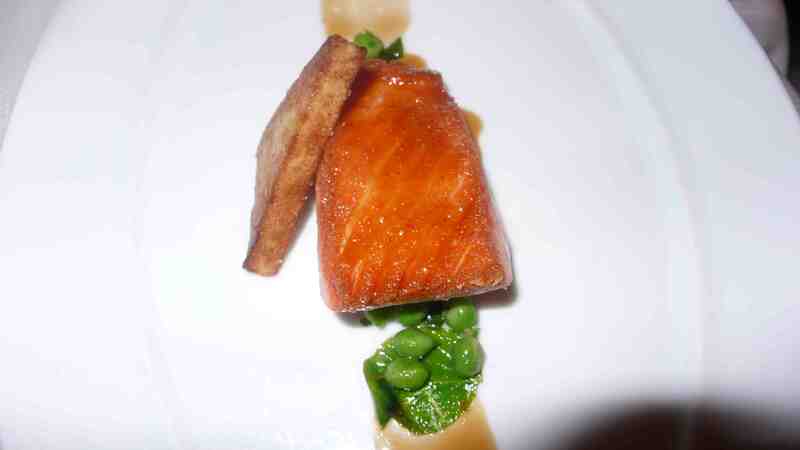 For the first of two main fish courses I had the King salmon with English peas and heart of palm and Matt had the halibut with squid, melted onions and baby fennel. 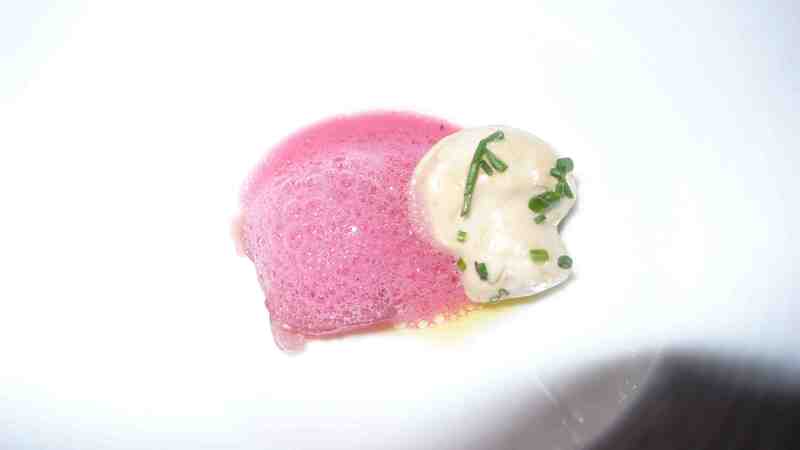 The next two courses included two of my favorite ingredients, lobster and foie gras. 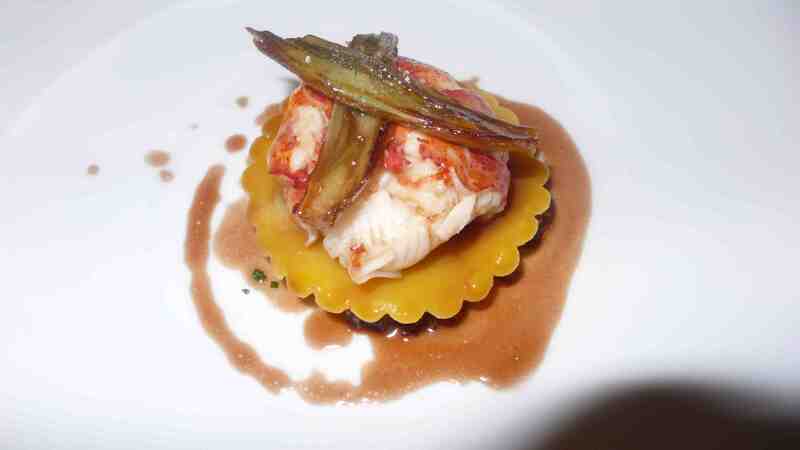 First we had lobster with mousseron mushroom, snap peas and chicken oyster (really yummy) and a lobster dish with short rib raviolis and a ruby port reduction. 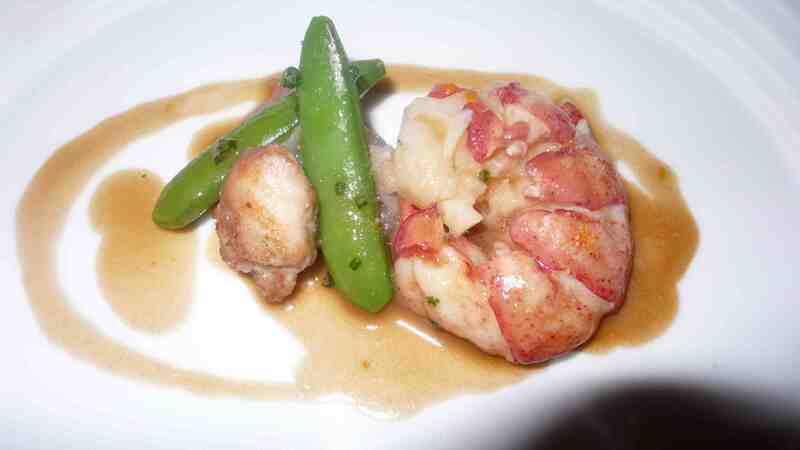 We both loved these lobster dishes. 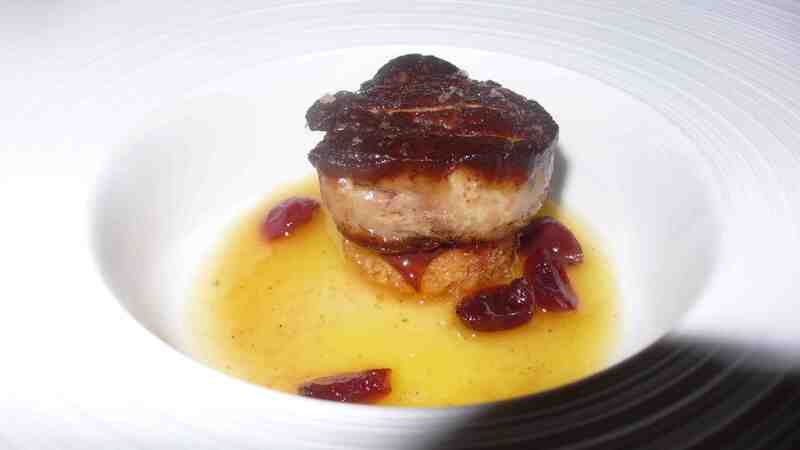 Next came the foie gras, I had the hot foie gras with a spicy cherry compote over a brioche with a pineapple reduction (my fave of the night) and Matt had the spiced apple poached foie gras with a cherry glaze and mulberry terrine with apricot jam. Yum. 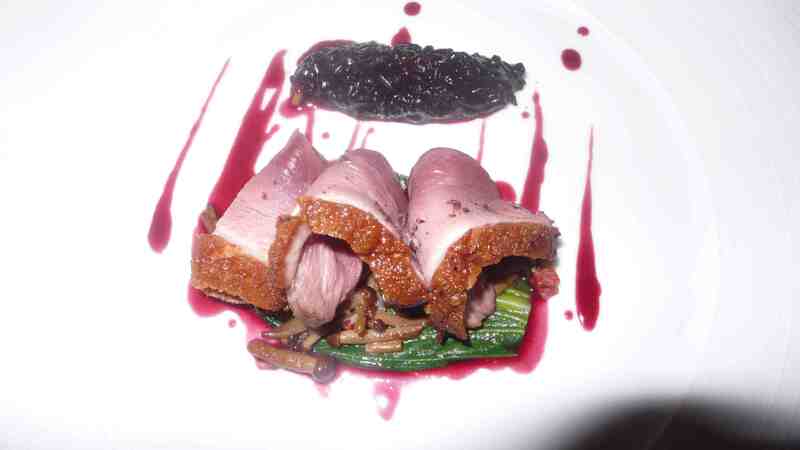 Next came the foul portion, I had duck with black rice, enoki mushrooms and cherries (really good) and Matt got the rabbit with fava beans, radish and a leek puree. 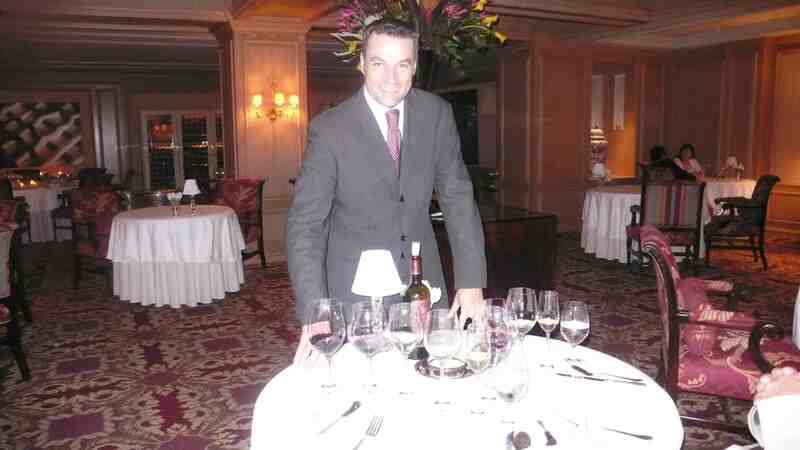 Throughout the meal we also enjoyed wine pairings, here is our sommelier. 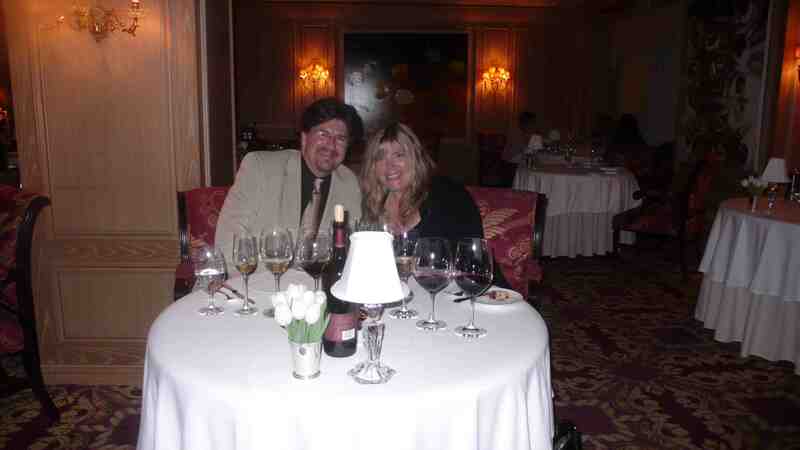 I knew after the third glass of champagne that there was no way I could track of all the wines, so I just had the sommelier take a pic of us with our wine glasses to remember how many glasses we had. 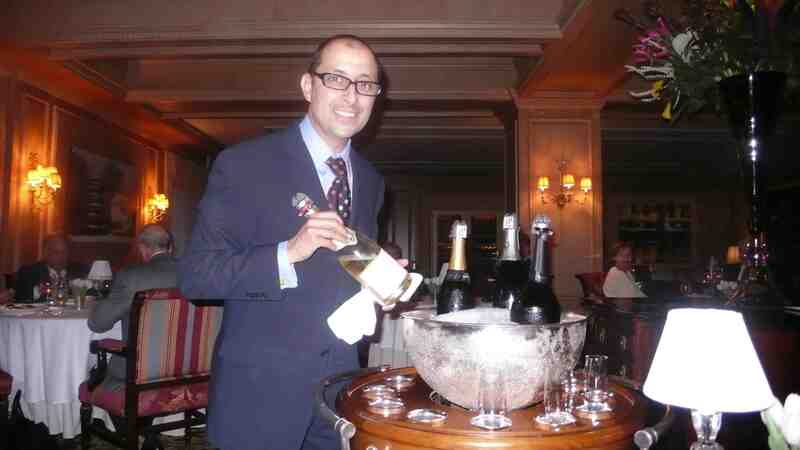 The wine list is exceptional at the Dining Room and it is definitely worth it to ask for a pairing from the sommelier. Before dessert, we enjoyed Kobe beef with potato, porcini mushrooms and sancho pepper (another fave) and Pozzi Farm lamb with pesto and zucchini blossoms served in a madeira reduction. Our desserts, yep we also had four samples of desserts!, included a mango sorbet with strawberry consome, a peach sorbet with rooibos tea granite (very interesting combination and good), chocolate manjari cake with caramel and sea salt, macadamia nut ice cream and a cocoa nib crisp and a composition of tropical fruits including a coconut crepe, papaya lime sorbet and passionfruit chiboust (our fave of the desserts). We thought we were done but to our suprise the waiter rolled out the petit four cart with dozens of perfectly crafted bite sized cakes and pastries. They looked amazing but since we barely fit in our chairs after so much food the waiter wrapped up a bunch of them which Matt took home to Joan. This was one of the longest (4 1/2 hour) dinners and extensive tasting menus I had on my San Francisco trip but it was one of the best meals I have ever had. It is definitely worth a trip to the classic Ritz Carlton to view the beauty of the resort and to taste the wonderful food in the Dining Room. 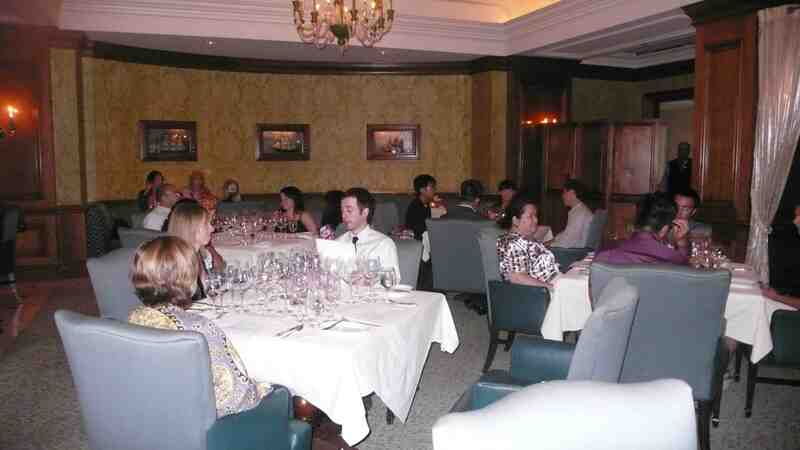 The Dining Room, Ritz Carlton San Francisco. 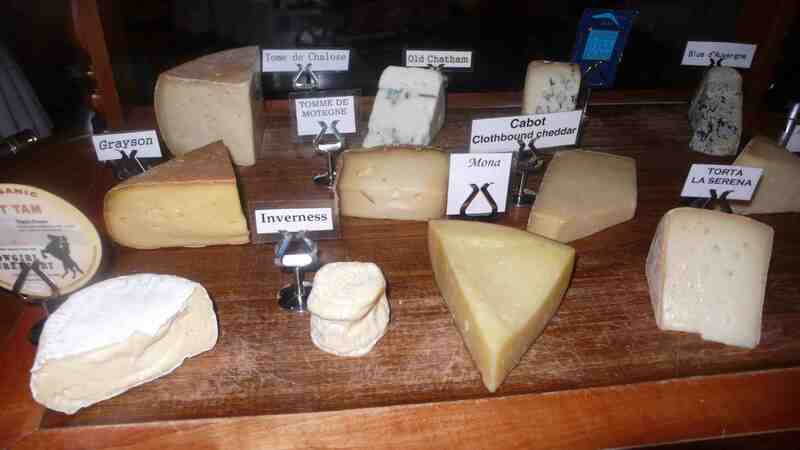 Last night food writers and bloggers joined together to taste the new menu at the Langham Hotel. 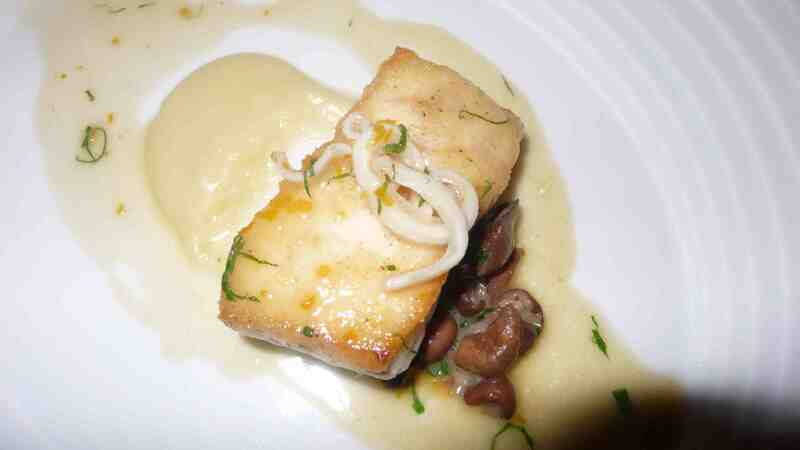 Chef Michael Voltaggio presented a seven course tasting menu for the guests. Chef Voltaggio is one of seventeen chefs that will compete on Bravo’s sixth season of Top Chef, debuting next Wednesday night on Bravo. 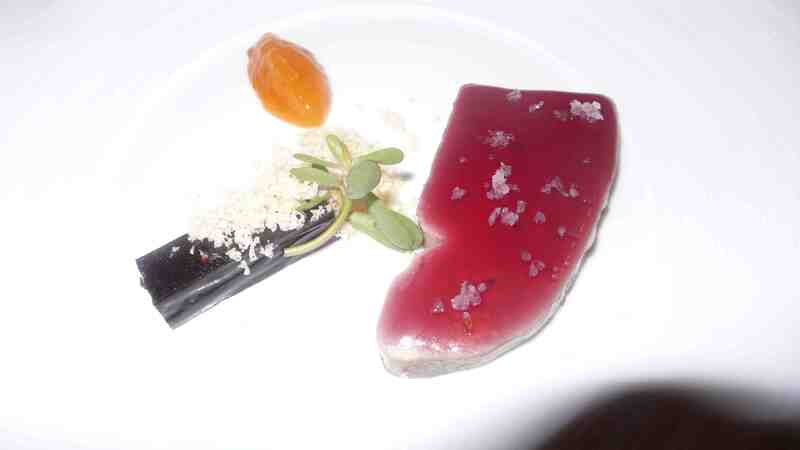 We began with a blue fin tuna and mushroom dish to start off. 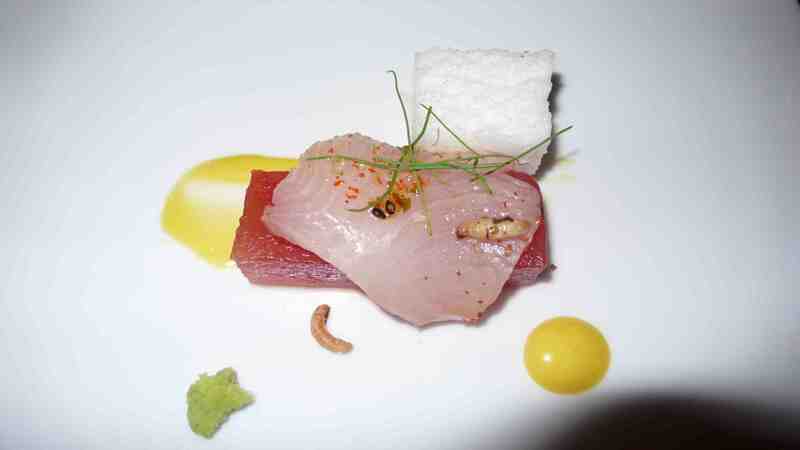 Next came a Pacific Yellowtail sashimi dish with soy watermelon, sea sponge and smoked egg yolk. 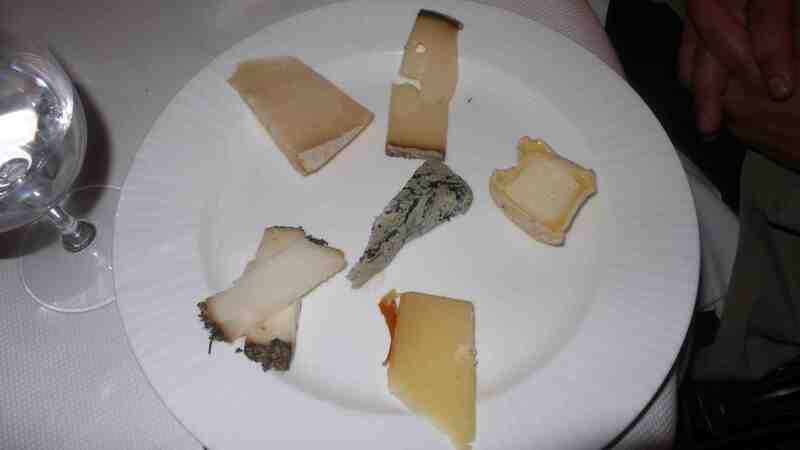 We all liked this starter. 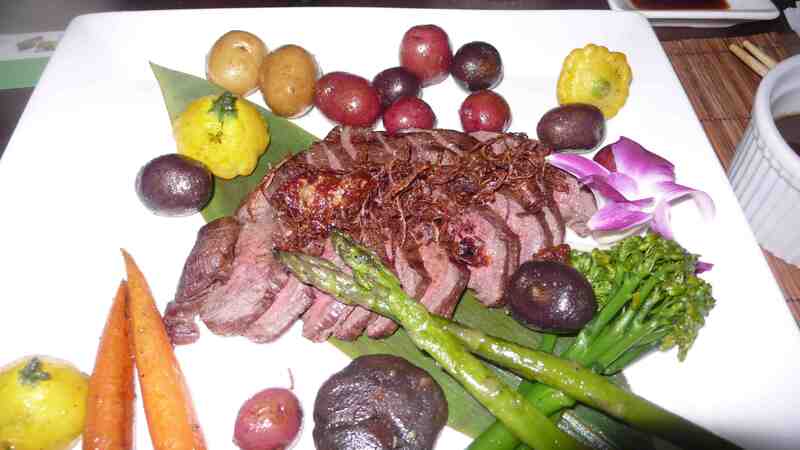 It was paired with a 2008 Crios de Susana Balbo Torrentes from Cafayate. Next was octopus with buttered popcorn, piquillo confetti and cilantro. 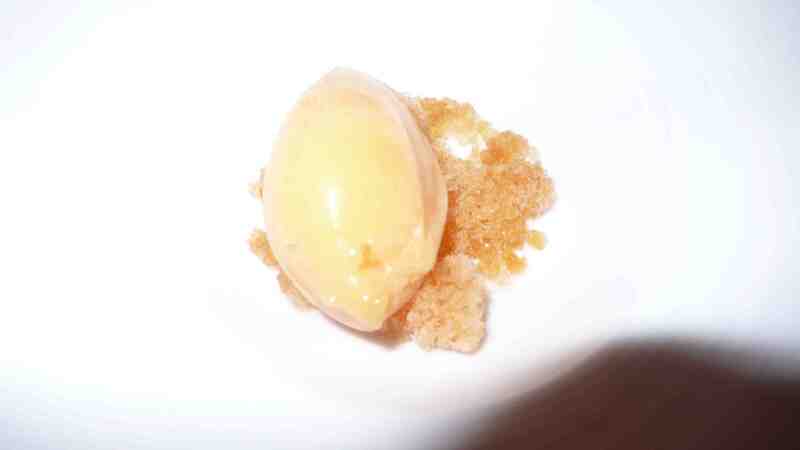 Paired with a 2005 Peter Howland Maxwell Vineyard Chardonnay from Hunter Valley. This was also a fave. 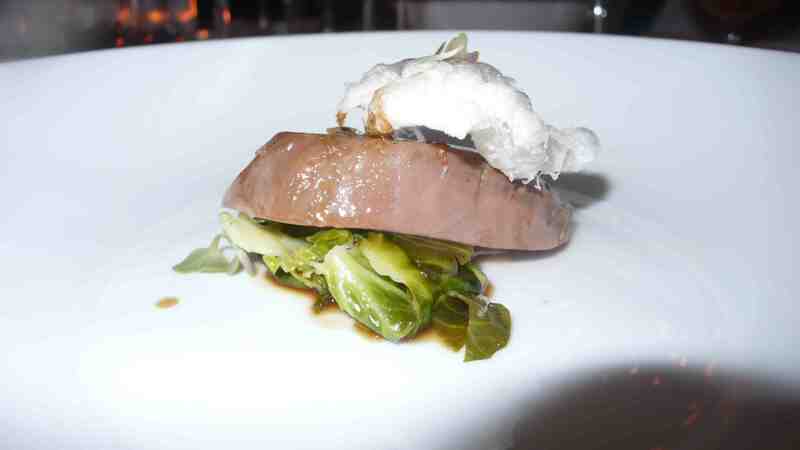 Third was a pastrami pigeon with rye infused jus, brussels-kraut and a puffed Gruyere Cheese. 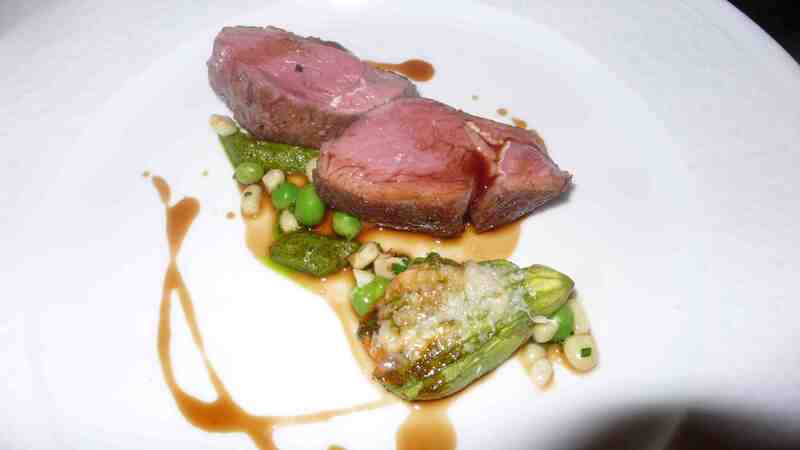 I liked this the least but I am not really fond of pigeon. 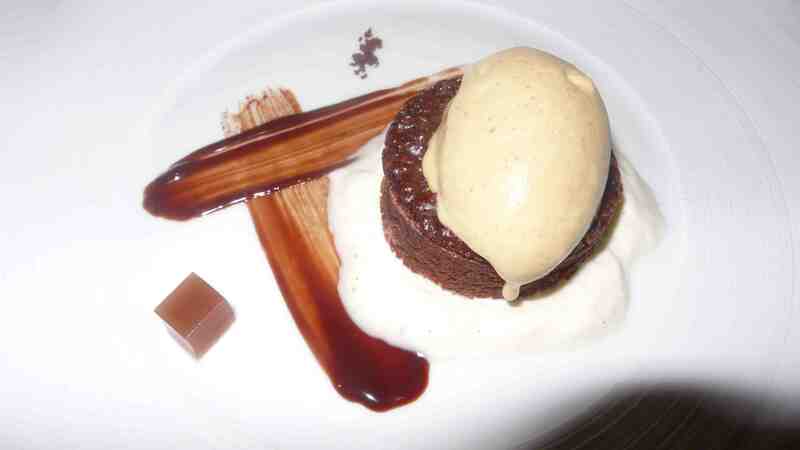 Served with a Univroue 17, Strong Dark Ale. 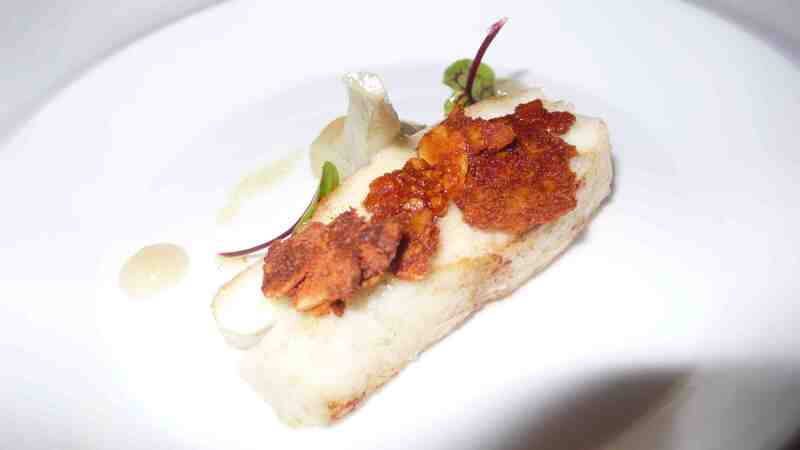 We were also served turbot, with artichoke, tomato granola and lime and vanilla. Some at the table liked the dish and a few were not fond of the smell of the vanilla with the turbot, but liked the taste. 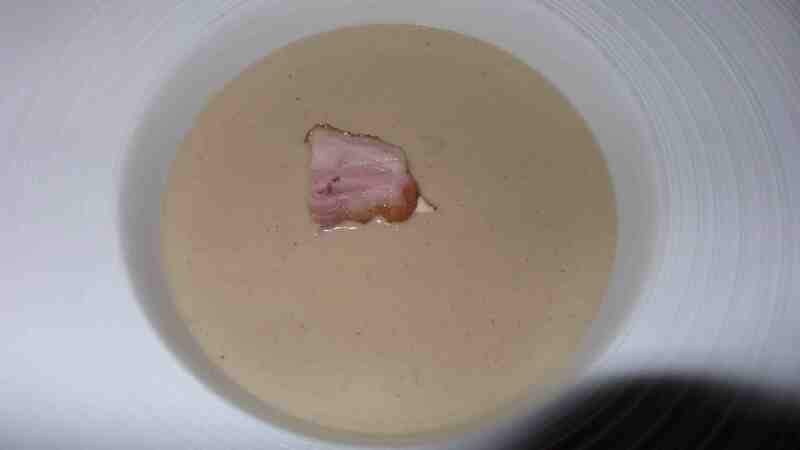 Served with a 2007 Salwey Henkenberg GG, Pinot Gris QMP. 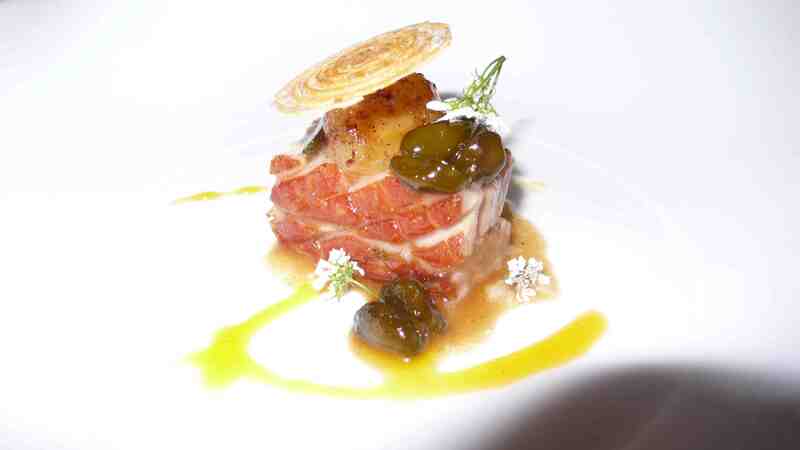 Then came the fave of the night, a suckling pig with pistachio beans, onions, orange juice reduction and coriander. 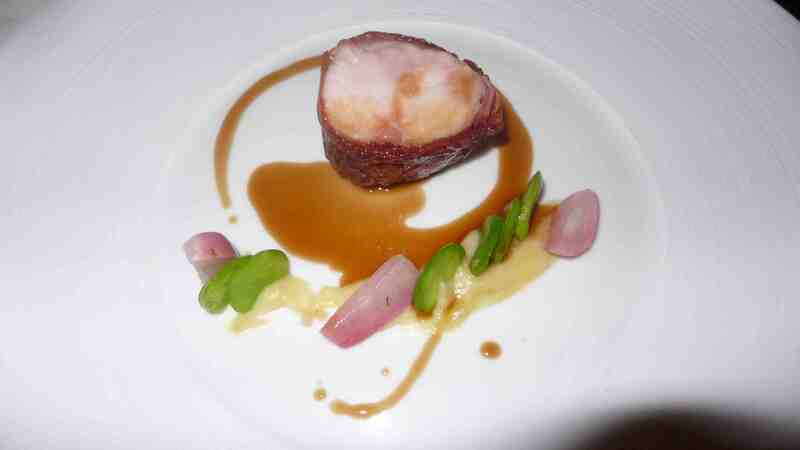 Served with a 2000 August Kesseler “S”, Pinot Noir, Assmannshausen. 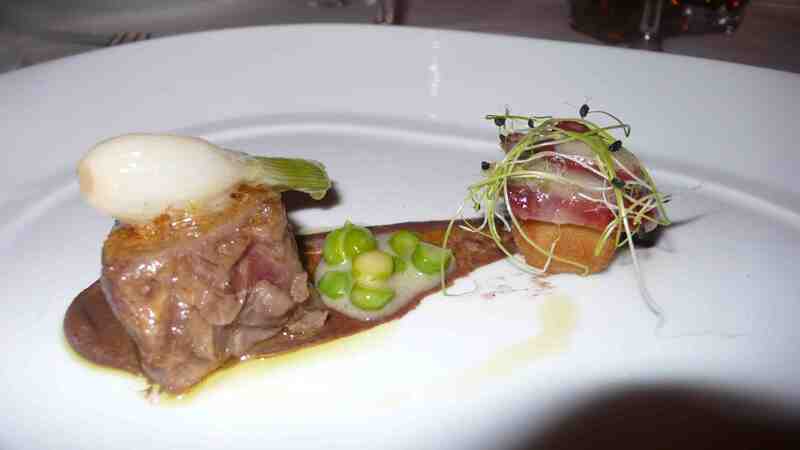 Next came another tasty dish, lamb confit with pickled tongue, eggplant-raisin and fresh hummus. 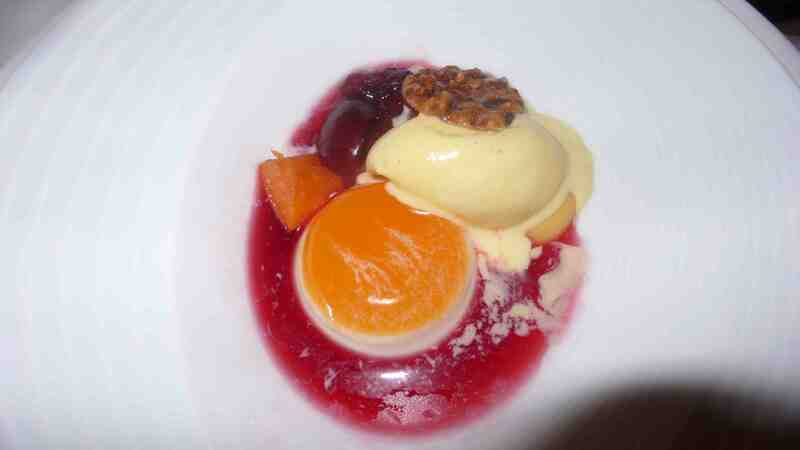 Served with a 2006 Villa Creek Avenger, Syrah/Mourvedre/Grenache from Paso Robles. Chef Voltaggio briefly stepped out of the kitchen to say hello. 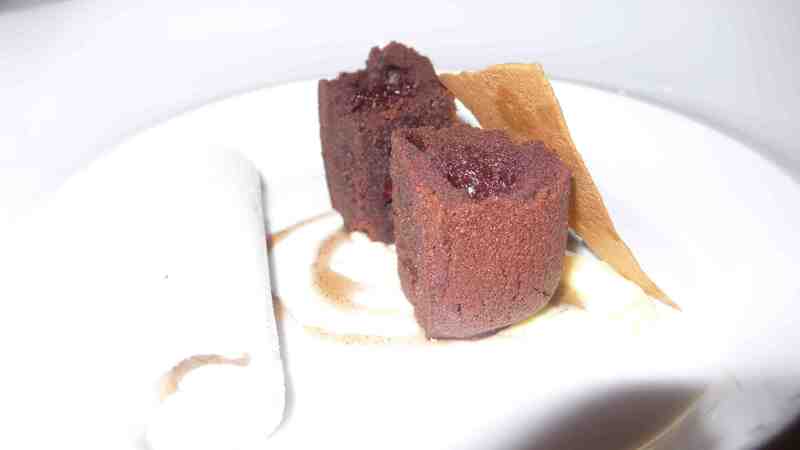 Our last course was a coffe cake with baked honey, espresso mousse and lemon curd. 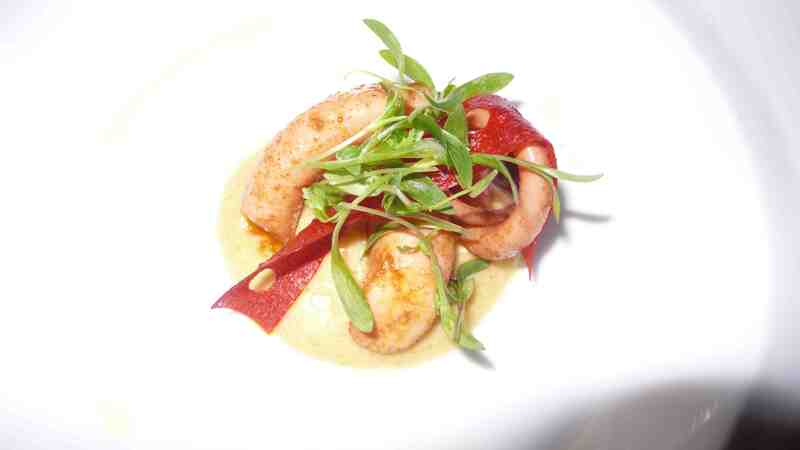 Served with a 2004 Paringa Individual Vineyard Sparkling Shiraz. 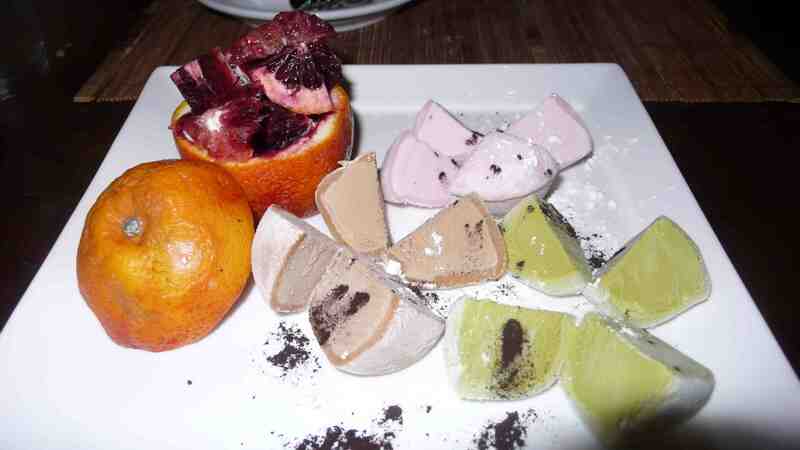 We also had some cool small desserts, a passionfruit candy and a pop rock mint chocolate. 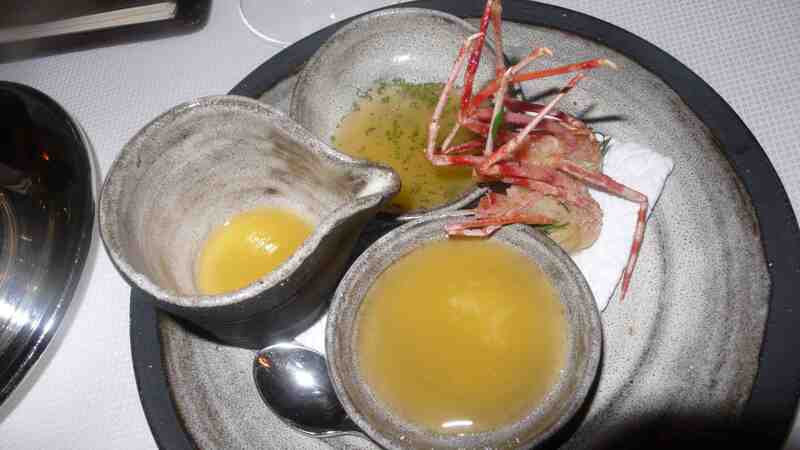 The entire menu was very innovative and holds new suprises for Langham diners. My interview with Chef Voltaggio will appear in the November issue of Pasadena magazine. Also root for him on Top Chef!